Our nation is currently experiencing growing levels of income and wealth inequality, which are contributing to longstanding racial and ethnic gaps in education outcomes and other areas. These large gaps, in combination with the significant demographic changes already underway, are threatening the economic future of our country. Thus, closing racial and ethnic gaps is not only key to fulfilling the potential of people of color; it is also crucial to the well-being of our nation. This report quantifies the economic benefits of closing one of the most harmful racial and ethnic gaps: the educational achievement gap that exists between black and Hispanic children and native-born white children. Gaps in academic achievement are a function of a host of factors, such as income and wealth inequality, access to child care and preschool programs, nutrition, physical and emotional health, environmental factors, community and family structures, differences in the quality of instruction and school, and educational attainment. This suggests there are a wide range of public policies that could help narrow educational achievement gaps; this report demonstrates that there are enormous payoffs to closing the gaps through public policies. It also outlines effective public policy strategies to achieve this goal, though their details are left to future research. After briefly summarizing the analysis’s findings, this report places the educational achievement gaps in context to help explain their significance and the reasons they exist. In particular, the report reviews data on growing inequality, demographic changes, and intensifying global economic competition. This clarifies the need to address educational achievement gaps and helps explain why the benefits of closing gaps are great. The report then describes factors that cause educational achievement gaps and offers public policies that could help close them. The subsequent sections of the report discuss the literature on the importance of academic achievement to economic growth, the methodology used in the analysis, and its detailed findings. This report illustrates one aspect of the staggering economic cost of the failure to adequately invest in the development of our people: It estimates the increases in U.S. economic growth that would occur if racial and ethnic achievement gaps were closed and the educational playing field were leveled. Specifically, this analysis projects how much greater U.S. gross domestic product, or GDP, would be from 2014 to 2050 if the educational achievements of black and Hispanic children were raised to match those of native-born white children. This study does not examine gaps that exist among other groups—such as Native Americans, Asians, and children of more than one race—because of data limitations and small sample sizes. This does not imply that achievement differentials among other groups do not exist, are not harmful, or do not deserve attention. If the United States were able to close the educational achievement gaps between native-born white children and black and Hispanic children, the U.S. economy would be 5.8 percent—or nearly $2.3 trillion—larger in 2050. The cumulative increase in GDP from 2014 to 2050 would amount to $20.4 trillion, or an average of $551 billion per year. Thus, even very large public investments that close achievement gaps would pay for themselves in the form of economic growth by 2050. Closing racial and ethnic achievement gaps—by raising incomes and increasing the size of the economy—would also have significant positive impacts on federal, state, and local tax revenues. From 2014 to 2050, federal revenues would increase by $4.1 trillion, or an average of $110 billion per year. State and local government revenues would increase by another $3.3 trillion, or $88 billion annually. Therefore, government investments in closing educational achievement gaps that cost less than an average of $198 billion annually over the next 37 years would pay for themselves even in strictly budgetary terms. To put this figure in perspective, consider that the annual cost to implement the Obama administration’s high-quality, universal pre-K program averages $7.5 billion per year over the first 10 years. As explained in the report, these projections understate the impact of closing achievement gaps for at least three reasons. First, they assume that educational achievement improvements are limited to black and Hispanic children; in the real world, policies that increase these children’s educational achievement are likely to improve all children’s achievement. Second, the model does not take into account any of the social benefits—such as better health outcomes—that are likely to occur as a result of educational improvement. Finally, the model does not calculate the potential positive effects on children born to future parents who, because of improved academic achievement, will have higher incomes and thus be able to provide them better educational opportunities. If the model properly accounted for all of these factors, the benefits of improving educational achievement would be substantially larger than those estimated in this study. 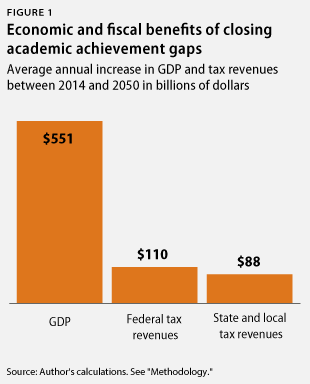 The benefits of closing educational achievement gaps amount to much more than just increased GDP and tax revenues. The current generation of children will be better off when they are adults because they will have higher earnings, higher material standards of living, and an enhanced quality of life. Future generations of children will be more likely to grow up in families that can offer them the enriching opportunities of a middle-class lifestyle; they will therefore be less likely to grow up in families struggling in poverty. Present-day adults, whether working or in retirement, will benefit from the fact that higher-earning workers will be better able to financially sustain public retirement benefit programs such as Medicaid, Medicare, and Social Security. The retirement of the Baby Boomers will put pressure on the federal budget in the coming decades as more retirees draw from these benefit programs. Investing in the nation’s educational achievement will provide future budget relief as Americans earn more and, thus, pay more in taxes. For example, closing racial and ethnic educational achievement gaps would lift Social Security tax contributions by $877 billion by 2050. Similarly, Medicare tax revenues for the Hospital Insurance Fund would increase by $265 billion from 2014 to 2050, providing a substantial boost to Medicare solvency.6 In other words, strengthening the educational achievement of our youth will help provide economic security for us, the elderly, and future generations. These potential economic gains illustrate in stark terms the massive waste of human talent and opportunity that we risk if achievement gaps are not closed. They also suggest the magnitude of the public investments the nation should be willing to make now and in the decades to come to close achievement gaps. Even from a very narrow budgetary perspective, the tax revenue gains this study forecasts suggest that investments to close racial and ethnic achievement gaps could amply pay for themselves in the long run. Robert G. Lynch is a Senior Fellow at the Center for American Progress and the Everett E. Nuttle professor of economics in the Department of Economics at Washington College. Patrick Oakford is a Policy Analyst at the Center for American Progress.